Have I got a salad for you today! 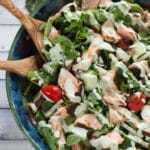 This Spicy Salmon Pasta Salad with Mixed Greens and Creamy Dill Dressing is so easy, tasty and healthy! It includes quinoa pasta, spinach, arugula, tomatoes, sugar snap peas, cucumber and, of course, salmon. 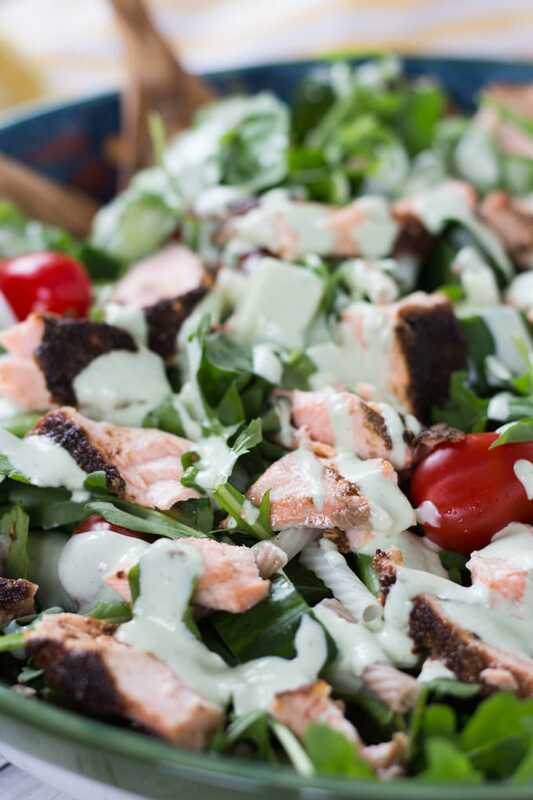 It’s also topped with a creamy dill dressing made with Greek yogurt and feta cheese. 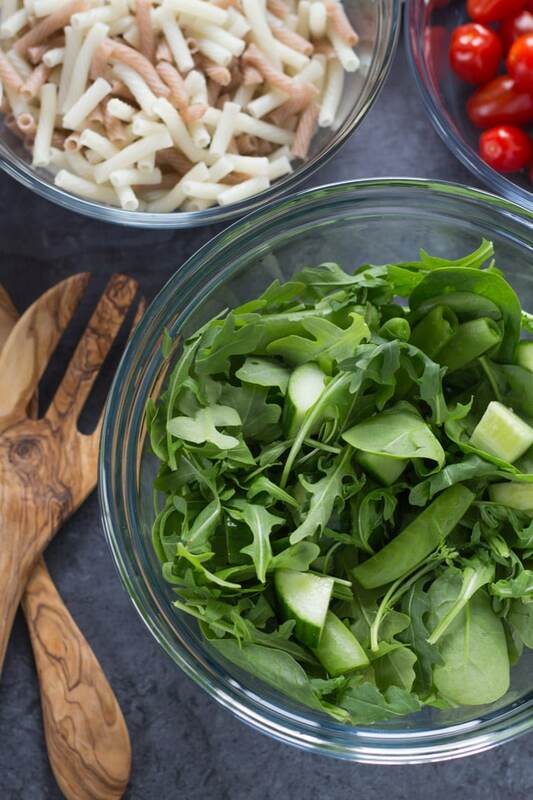 All of these ingredients make this a wholesome, clean eating, gluten-free pasta salad. So delicious! I have a lot to share with you about this recipe, so let’s jump in! First of all, it’s the Victoria Day long weekend (AKA May 24 weekend in Canada) so happy Monday holiday! I was super excited for this weekend to experiment with and share some BBQ related recipes. Not happening! It’s snowy and chilly, so my BBQ related recipes will just have to wait. Not that we haven’t used the BBQ this weekend, or even in a January snow storm! Hello?! Hot dogs and burgers are made for winter grilling! The hot dogs were for a friend, I swear 😉 . Aside from a barbequed turkey burger (seriously, the hot dogs were for my husband :)), I’ve been eating this Spicy Salmon Pasta Salad all weekend! For one, it is so delicious and filling. I don’t usually eat a lot of pasta, but when the pasta is made with quinoa and the recipe includes healthy seafood with omega 3 fatty acids and lots of greens, you’ve got yourself a salad worthy of a main meal. The other reason I’ve been eating this salad all weekend (and sharing with family too!) 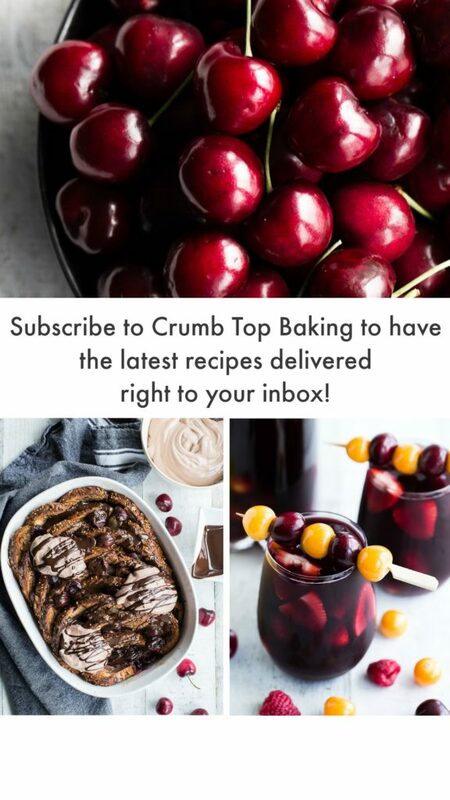 is because this recipe makes a lot….and I made it twice! Since it makes a lot, this Spicy Salmon Pasta Salad is perfect for meal prep Sunday (or holiday Monday this week!). It could definitely make four solid meals for the week. You could store the salmon, veggies, pasta and dressing separately and assemble when ready to eat. It’s also perfect to bring as your pot luck contribution for a BBQ this summer. As I said, it makes a lot and it is served cold, so no worries about heating before serving! So, if the salmon turned out, why would I need to re-make the recipe? Surely, veggies and pasta are not that complicated? They aren’t really, but I over did it on the pasta and thought spiralizing the cucumber would be brilliant! Not so 🙁 . The first version of this salad had too much quinoa pasta and not enough veggies. I know it is called a pasta salad, but I like to incorporate as many greens as possible! And with so much pasta, it was too filling (I know, there is such a thing apparently!) and it overwhelmed the other ingredients. So, for the next version, I decreased the amount of quinoa pasta and upped the spinach, arugula, and tomatoes and threw in some sugar snap peas for good measure. I had a lot of cucumber to use up, so I thought the best way to do that would be to spiralize it for this recipe. I thought it would fill out the dish and look really nice! While it looked and tasted great, functionally, it was not a great idea. The spiralized cucumber created endless strands of cucumber noodles, which made serving up individual salad portions challenging. (It would have been great if I was eating the entire bowl myself). I was using my fingers to de-tangle the cucumber, which would probably be frowned upon at a potluck! Not to mention super messy. So, for the next version, I chopped the cucumber into chunks. This worked much better and meant I had less mess to clean up! The salad is topped or tossed with a creamy dill dressing, which I made with plain Greek yogurt, fresh dill, fresh lemon juice, garlic powder, and crumbled feta cheese. You could make this dressing two different ways, and they both work really well for this salad. The first time I made it, I stirred all the ingredients together, so you could see the flecks of dill and chunks of feta. I tossed the salad with the dressing, which made it look like a traditional, creamy pasta salad. The next time, I blended all the ingredients together in a blender, which made the dressing a little runnier (better for drizzling on top of the salad). It also had a slight mint green color from the dill, which looked kind of pretty and summery 🙂 . They both tasted great. It just depends on the look and texture you prefer in your salad dressing. I’m eating this for the third night in a row, and I’m not sick of it yet! So you should definitely make this for a long-weekend or summer BBQ! Enjoy 🙂 ! This Spicy Salmon Pasta Salad with Mixed Greens and Creamy Dill Dressing is so easy, tasty and healthy! It’s ready in 30 minutes and is perfect for a family meal, Sunday meal prepping, or a potluck BBQ. The recipe includes quinoa pasta, spinach, arugula, tomatoes, sugar snap peas, cucumber and, of course, salmon. It’s also topped with a creamy dill dressing made with Greek yogurt and feta cheese. So delicious! Divide the tbsp. of olive oil. 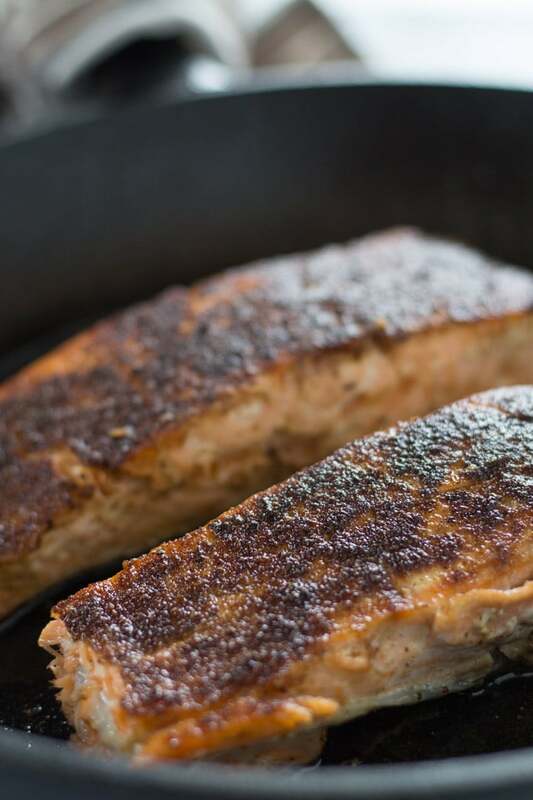 Add half to a frying pan and spread the other half on the top of the salmon fillets. Turn the frying pan on low to pre-heat. Meanwhile, combine the spices, garlic, salt and pepper and sprinkle all of it on top of the salmon fillets. Lay the fillets face down (skin side up) in the frying pan and cover. Cook on low for 15 minutes, or until the salmon is opaque. The time will vary slightly depending on how thick the fillets are. Once cooked, let sit for a few minutes and then use a fork to flake apart into large pieces. While the salmon is cooking, begin assembling the salad. Cook the quinoa pasta according to the package instructions. This should only take 3-4 minutes. Once cooked, run under cold water and drain well. Meanwhile, chop the cucumber and prepare the spinach, arugula, tomatoes and peas. 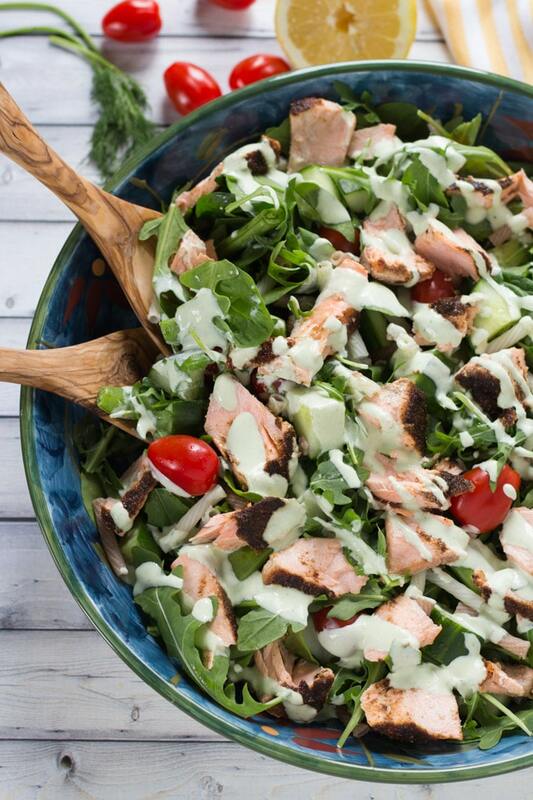 If you are eating the salad immediately, combine the pasta and veggies in a large bowl and place pieces of salmon on top of the salad. In a small bowl, or blender, combine the yogurt, dill, lemon juice, garlic powder, and feta. Stir, or blend, until combined. (The blender will create a runnier consistency). Drizzle on top of the salad or toss the salad with the dressing. Store leftover salad in the refrigerator in an airtight container and enjoy within 2-3 days. 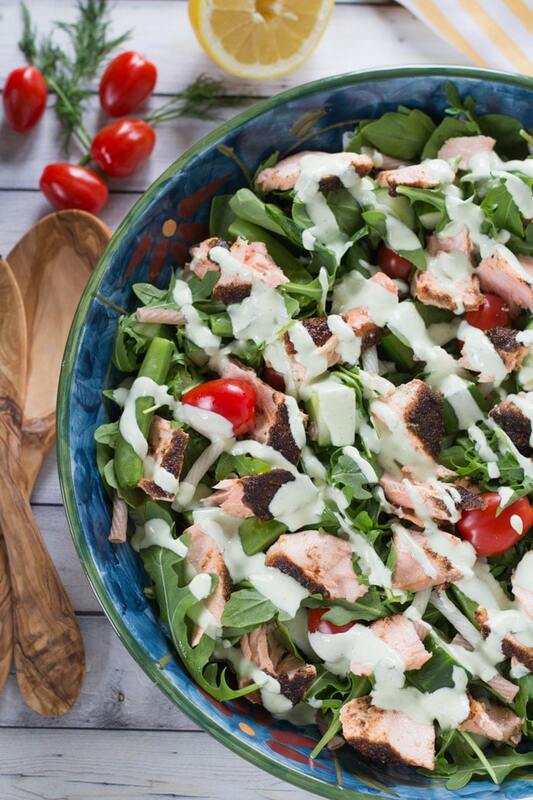 You can also store the salmon, pasta, veggies and dressing separately and assemble the salad when ready to eat. The dressing can be made two different ways. You can stir all the ingredients together in a small bowl, which will result in a thick and creamy dressing. The flecks of dill and chunks of feta will also be noticeable. Or you can blend the ingredients together in a blender, which will make the dressing a mint green color and a little runnier. It’s still creamy but the texture is better for drizzling on top of the salad. I found the quinoa pasta at Costco. It’s a red and white quinoa macaroni (GoGO Quinoa brand). It’s gluten-free and vegan and cooks in just a few minutes. So, you know when I saw it, I had to buy it and give it a whirl 😉 ). For the gluten-free version of this recipe, ensure your quinoa pasta and spices are gluten-free. Yay! I love salad and this one looks stellar! I may have to swap the salmon for tuna (my hubs is picky when it comes to fish) but still. This recipe is an excellent inspiration to eat well! Awesome recipe, have a great holiday!!! Thanks Christina! If you try this salad with tuna be sure to let me know how it turns out! Hope you’re having a great week! Oh I am in love with that creamy and delicious dill dressing Leanne! 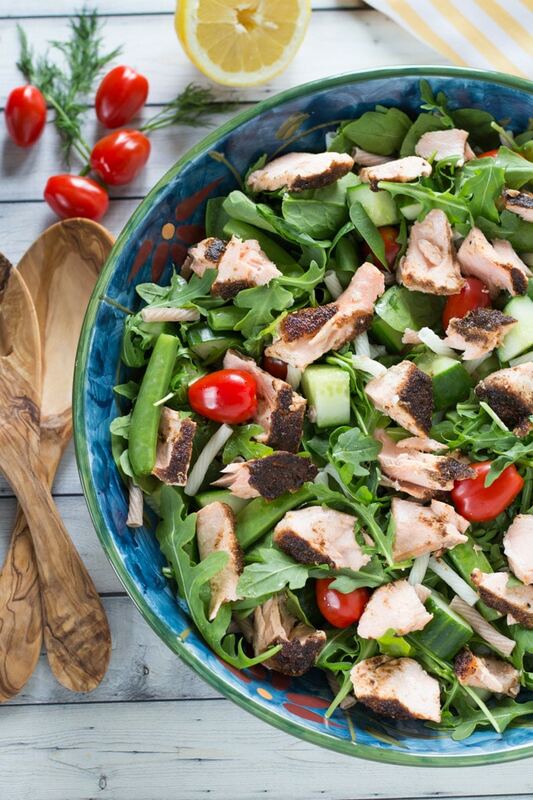 What a great salad recipe, I like my salads with salmon for its added health benefits. Need to try this out. Thanks Neha! I get tired of chicken on my salads sometimes, so I like to mix it up with salmon. Glad you like it!